1 2018-07-27T15:05:07+00:00 Minutes of Easton Conferences 3 (path) gallery 2018-08-09T12:18:56+00:00 1756-1758 The Kislak Center for Special Collections, Rare Books and Manuscripts. Curtis Collection, Folio 596PF. 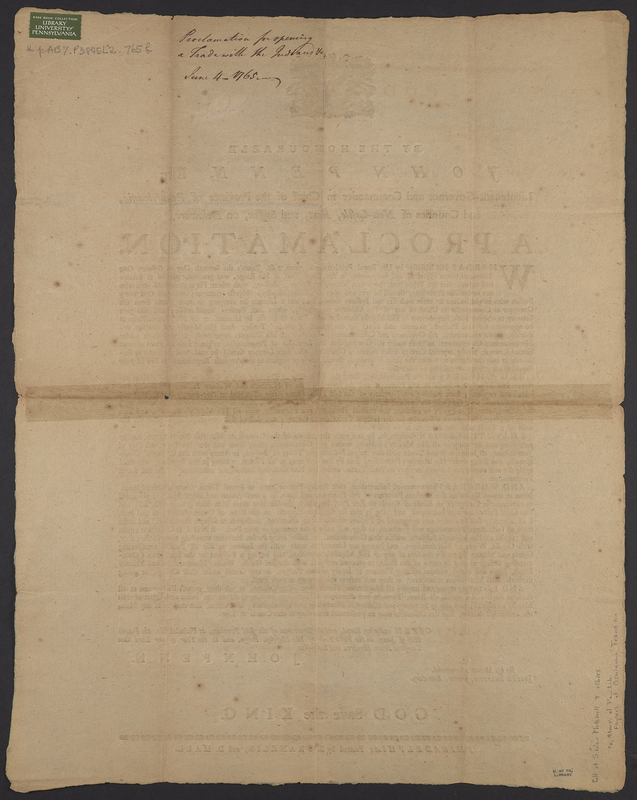 Philadelphia: Printed and sold by B. Franklin, and D. Hall, at the new-printing-office, near the market, MDCCLVII . Minutes of the treaty proceedings between the province of Pennsylvania and neighboring Indian tribes. Includes annotations from Benjamin Franklin, as noted in: The collection of Franklin Imprints in the Museum of the Curtis Publishing Company (Philadelphia: The Curtis Publishing Company, 1918), 2, 137-138, 142. Signatures: [A]2 B-H2. Title vignette: province seal. With: Minutes of conferences held with the Indians at Harris's Ferry, and at Lancaster, in March, April, and May 1757. 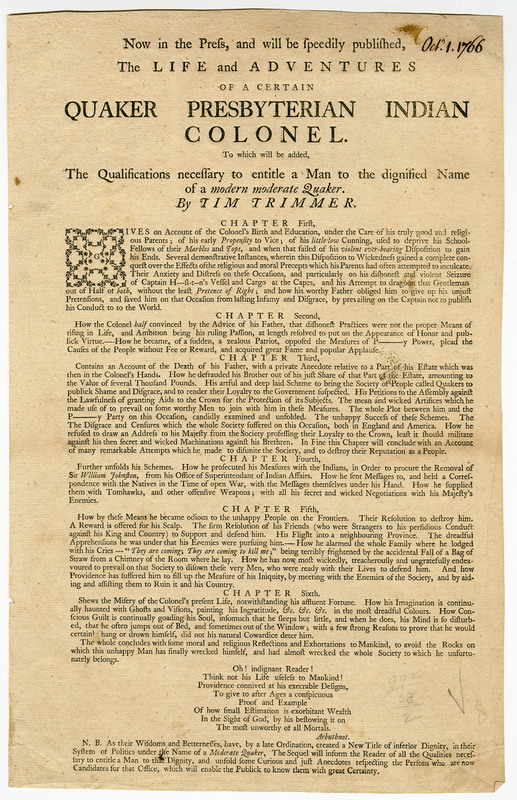 Philadelphia : Printed and sold by B. Franklin and D. Hall, 1757. -- Minutes of conferences held with the Indians at Easton, in the months of July and August, 1757. 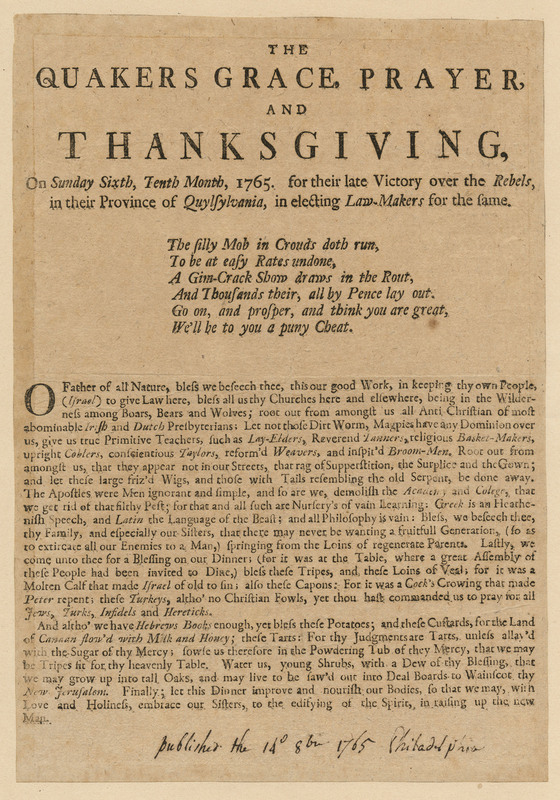 Philadelphia : Printed and sold by B. Franklin and D. Hall, 1757. -- Minutes of conferences held at Easton in October 1758. 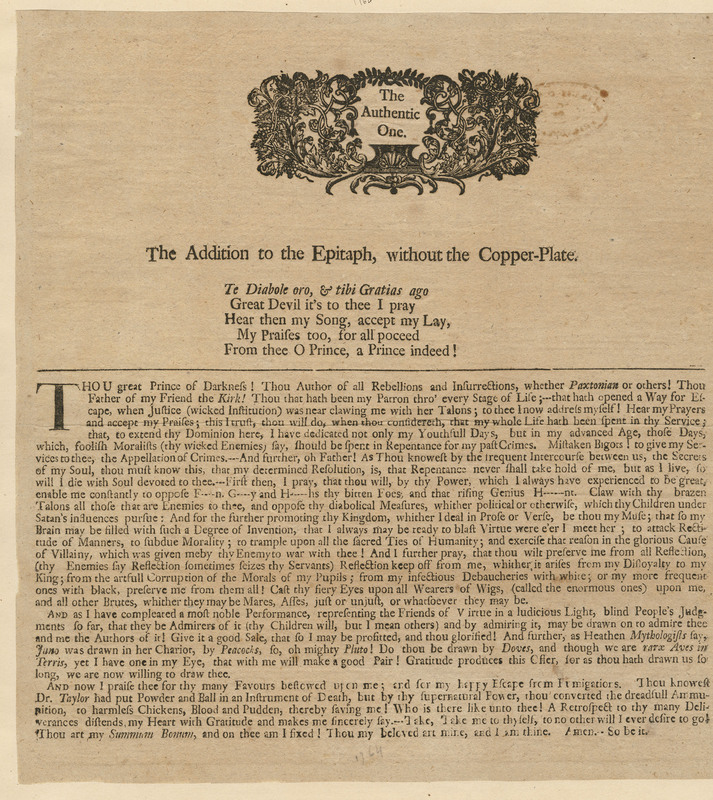 Philadelphia : Printed and sold by B. Franklin and D. Hall, 1758. Cited in: Evans 7923; Hildeburn, C.R. Pennsylvania, 1538; Miller, C.W. Franklin, 676. 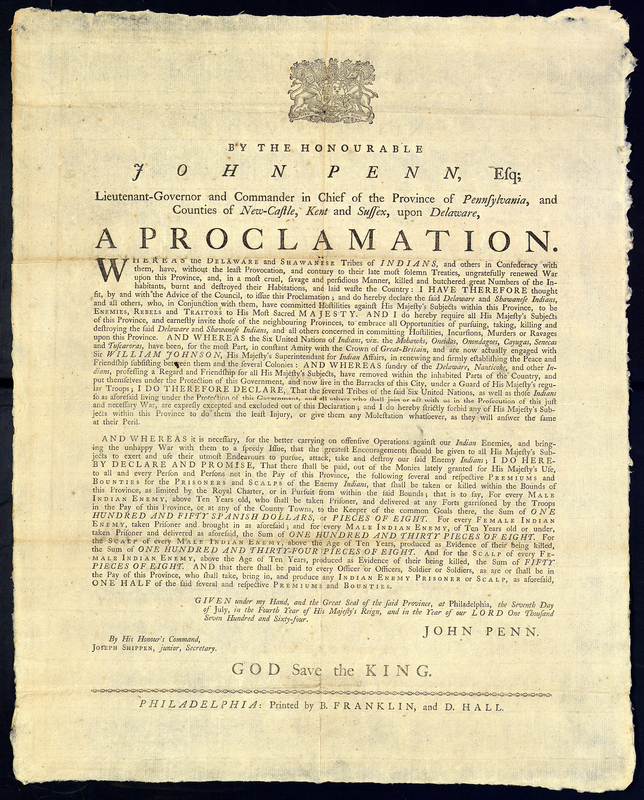 1 2018-07-23T01:02:45+00:00 Penn Proclamation, December 22, 1763 1 (path) gallery 2018-07-23T01:02:45+00:00 1763 Penn, John, 1729-1795. The Kislak Center for Special Collections, Rare Books and Manuscripts. Enjoining law officials to apprehend the murderers of six Conestoga Indians. Signed: John Penn. By His Honour's command, Joseph Shippen, secretary. Royal arms at head of title. Culture Class Collection copy is gift presented in 1903 by S. Weir Mitchell, and others, to the University of Pennsylvania Library, Papers of Benjamin Franklin. Culture Class Collection copy has ms. inscription on verso which reads "Proclamation for apprehending the murderers of the Conestoga Indians. December 22, 1763." Not in Evans or Hildeburn. Cited in: Bristol, B2431; Miller, C.W. Franklin, 796; Shipton & Mooney, 41405; ESTC, W7604. 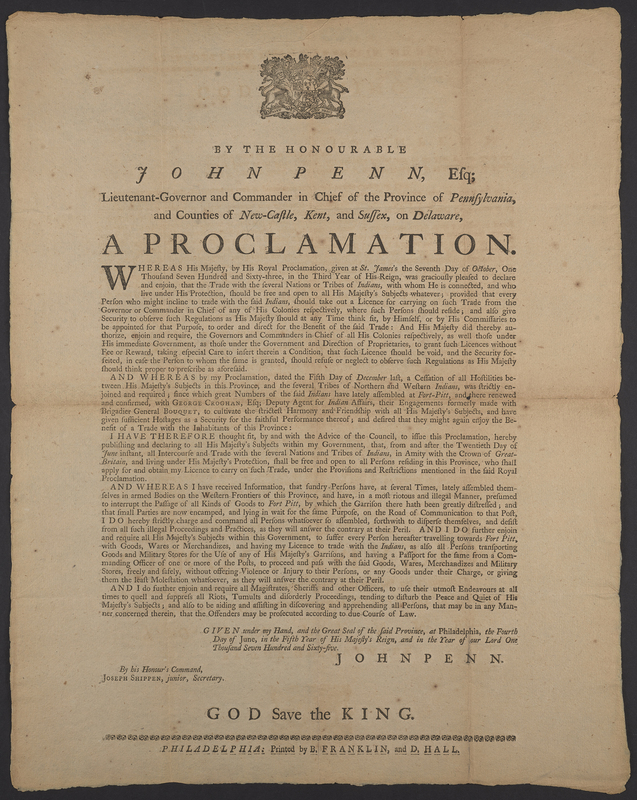 1 2018-07-23T01:03:51+00:00 Penn Proclamation, June 4, 1765 2 (path) gallery 2018-07-23T01:04:30+00:00 1765 Penn, John, 1729-1795. The Kislak Center for Special Collections, Rare Books and Manuscripts. Mapcase AB7 P3845L2 765b. Opening trade with the Indians. Signed: John Penn. By His Honour's command, Joseph Shippen, Junior, secretary. At head of title: royal arms. Culture Class Collection copy is gift presented in 1903 by S. Weir Mitchell, and others, to the University of Pennsylvania Library, Papers of Benjamin Franklin. Culture Class Collection copy has ms. inscription on verso which reads "Proclamation for opening a trade with the Indians. June 4, 1765." Cited in: Bristol, B2612; Shipton & Mooney, 41582; Miller, C.W. ; Franklin, 847; Evans, 41582; ESTC, W7607. 1 2018-07-23T00:51:12+00:00 The Pennsylvania Gazette, December 29, 1763 1 (path) gallery 2018-07-23T00:51:12+00:00 1763 The Kislak Center for Special Collections, Rare Books and Manuscripts. Flat Shelving AP2.A2 P355. 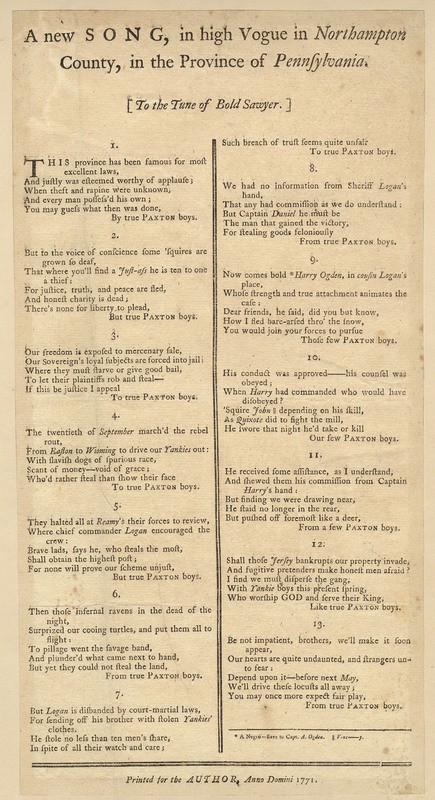 "Includes early mention of Paxton massacres and proclamation against Paxton Boys. 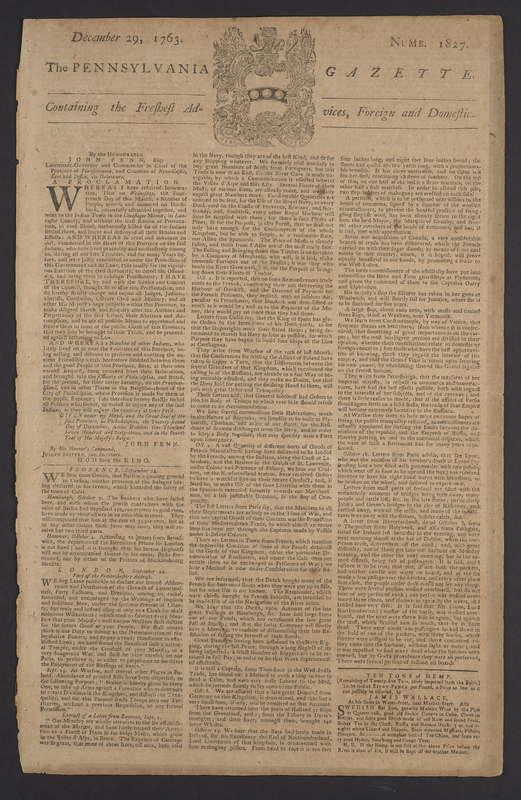 Weekly, Dec. 9/16, 1729-June 20, 1778. No. 40 (Sept. 25-Oct. 2, 1729)-[no. 2533] (June 20, 1778). Benjamin Franklin was owner and publisher from 1730-1750. Suspended between Nov. 1 and 14, 1765; between Nov. 27, 1776 and Feb. 5, 1777; and between Sept. 10 and Dec. 20, 1777." 1 2018-07-27T14:44:47+00:00 Ponteach; or, The Savages of America 1 (path) gallery 2018-07-27T14:44:47+00:00 1766 Rogers, Robert, 1731-1795. The Kislak Center for Special Collections, Rare Books and Manuscripts. AC7 R6333 766p. London: printed for the author and sold by J. Millan ..., MDCCLXVI . Signatures: A-G. A dramatization of Pontiac's conspiracy. Title vignette; head-piece on p. . Price from t.p. in square brackets: "Price 2 s. 6d." Printer's advertisement on final leaf. Culture Class Collection copy half-bound in red morocco over marbled boards; five raised bands on spine; six gold-tooled spine panels; brief title stamped in gilt in second spine panel; author stamped in gilt in third spine panel; date of imprint stamped in gilt at base of spine; top edge gilt. Cited in: Hill, F.P. Amer. plays, 253; Sabin, 72729. 1 2018-07-23T01:01:02+00:00 To the Freeholders and Other Electors for the City 2 (path) gallery 2018-07-23T01:01:34+00:00 1764 A, B, C, D, &c. The Kislak Center for Special Collections, Rare Books and Manuscripts. Mapcase AB7 A100 764t. "Printed by B. Franklin, and D. Hall. Philadelphia, 1764. An anti-proprietary election address. 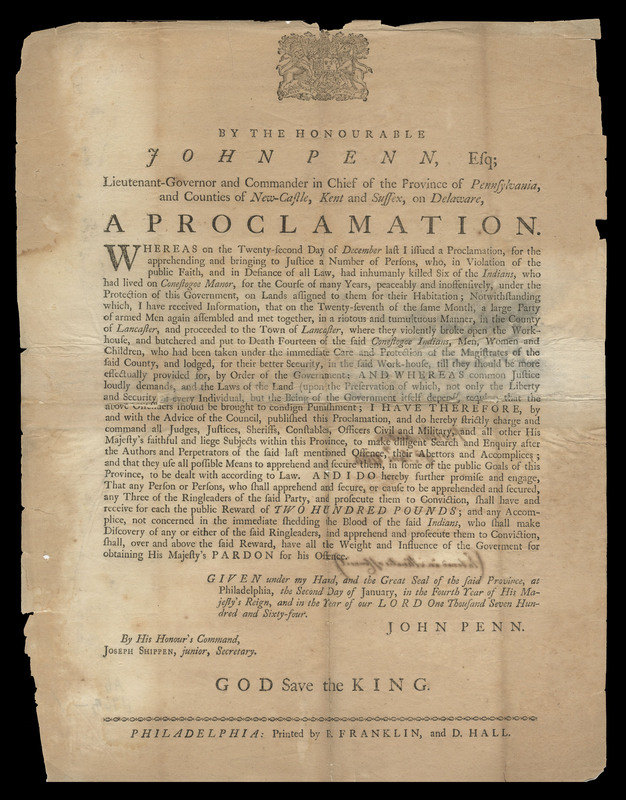 Opposing the Proprietary party in the Assembly election of 1764. Caption title. Signed at the end: A, B, C, D, &c. Imprint from Evans, 9854. Cited in: Evans, 9854; Sabin, 62319; Miller, C.W. ; Benjamin Franklin's Philadelphia printing, 834; Hildeburn, C.R. ; Pennsylvania, 2074; ESTC W6789." 1 2018-07-27T14:55:23+00:00 The Speech of Joseph Galloway 1 (path) gallery 2018-07-27T14:55:24+00:00 1764 Galloway, Joseph, 1731-1803. The Kislak Center for Special Collections, Rare Books and Manuscripts. F152 .D543 1764. 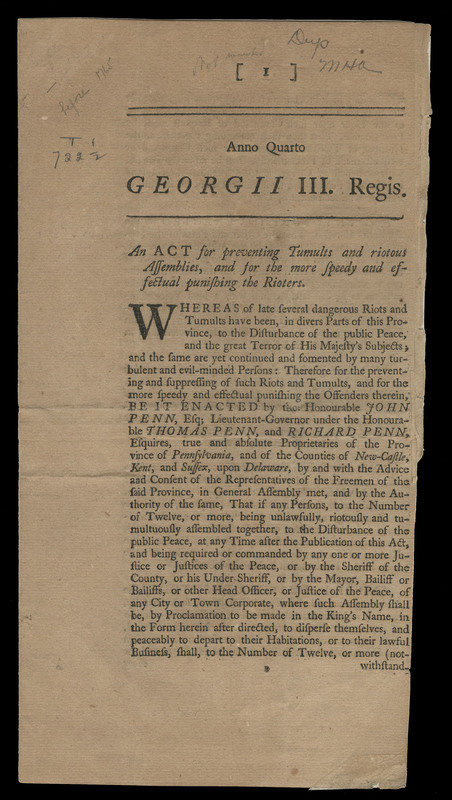 Philadelphia: Printed and sold by W. Dunlap, in Market-Street., 1764. Preface, p. iii-xxxv, by Benjamin Franklin. Signatures: a-d4 e2 [A]2 B-G4 (e2 verso blank; G3 verso, G4 blank). ''Errata.''--p. [xxxix]. Cited in: Evans 9671; Hildeburn, C.R. Pennsylvania, 1996; Adams, T. R. Brit. pamphlets 64-8a. 1 2018-07-27T14:47:37+00:00 The Universal Peacemaker 1 (path) gallery 2018-07-27T14:47:37+00:00 1764 Philanthropos. The Kislak Center for Special Collections, Rare Books and Manuscripts. AC7 A100 764u. Philadelphia: Printed by Anthony Armbruster, in Moravian Alley, 1764. Dated at end: Walnut-street, March, 25, 1764. Relating to the Paxton boys. Culture Class Collection copy is stitched and untrimmed; in cloth folder. Cited in: Evans, 9797; Hildeburn, C.R. Pennsylvania, 2080; ESTC, W31613. 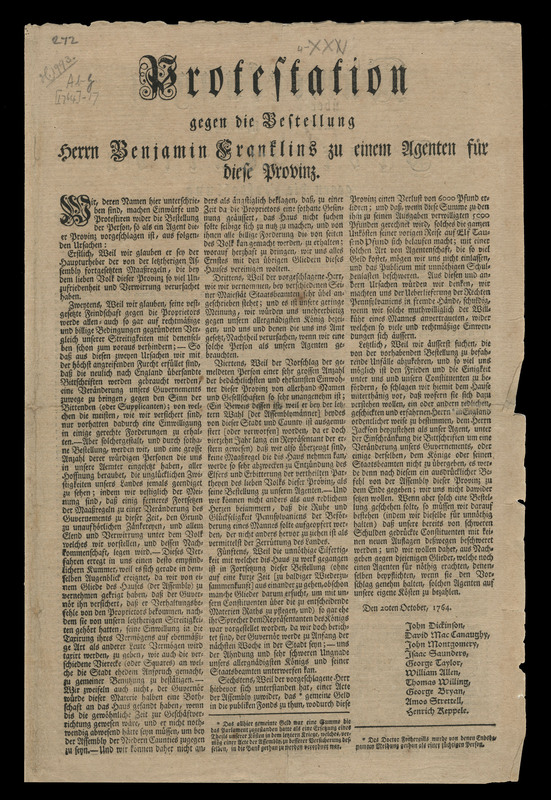 1 2016-08-19T13:48:09+00:00 Protestation gegen die Bestellung Herrn Benjamin Franklin 2 Protestation gegen die Bestellung Herrn Benjamin Franklins zu einem Agenten fur diese Provinz. gallery 2018-02-12T02:25:01+00:00 [Germantown, Pa. : Gedruckt bey Christoph Saur, 1764] Franklin, Benjamin, 1706-1790. 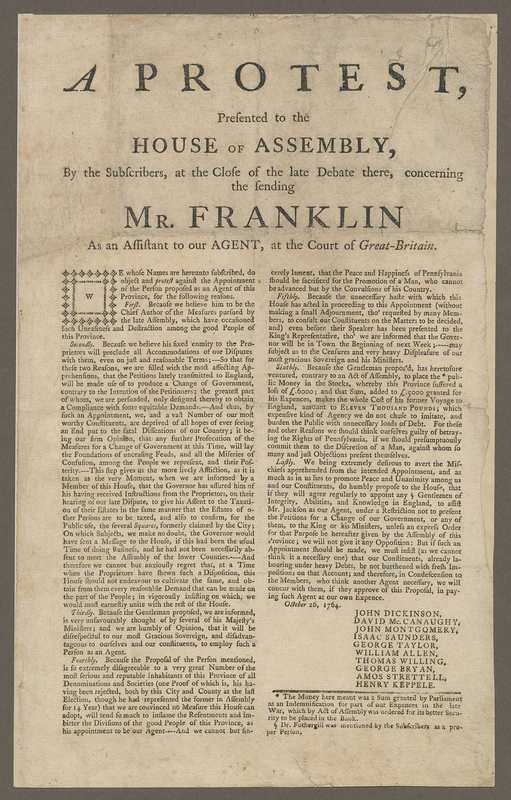 Call Number: AbG-17 German Translation of: Protest, presented to the House of Assembly [of Pennsylvania], by the subscribers, at the close of the late debate there, concerning the sending of Mr. Franklin as an assistant to our agent, at the court of Great-Britain (Bristol B2512). Caption title. Signed and dated: Den 20ten October, 1764. John Dickinson [and nine others]. 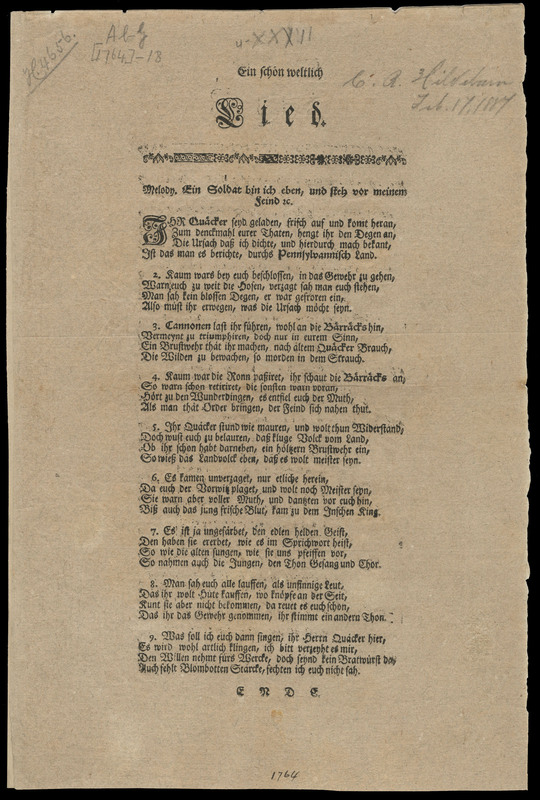 Followed on p. [2-4] by "Anmerkungen uber eine neuliche Protestation gegen die Bestellung Herrn Benjamin Franklins zu einem Agenten fur diese Provinz," a translation of Franklin's "Remarks on a late protest against the appointment of Mr. Franklin an agent for this province" (Evans 9669). Signed and dated on p. : Philadelphia, am 5 Nov. 1764. B. Franklin. Imprint supplied by Evans. 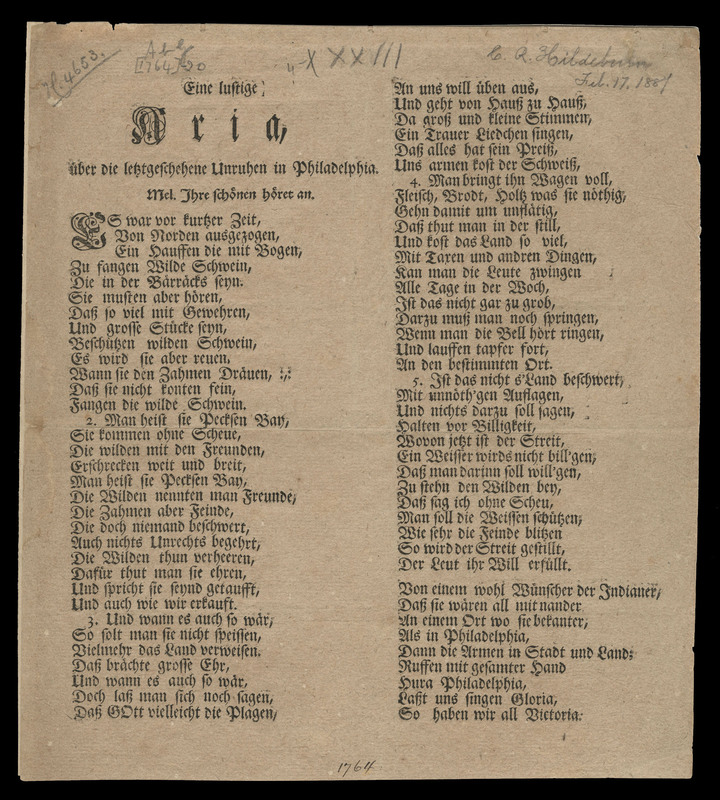 Erroneously filmed by Readex Microprint Corp. for Evans 9803, which records a German language broadside which apparently includes only the protest, and which is ascribed to the press of Henry Miller at Philadelphia. Evans, C. American bibliography, 9668; Evans, C. American bibliography, 9803; Hildeburn, C.R. Pennsylvania, 1993; English short title catalogue (ESTC), W21040. Historical Society of Pennsylvania. 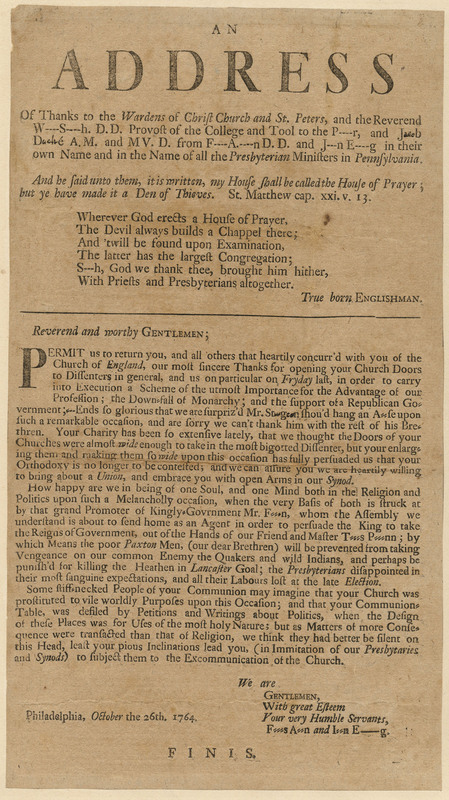 1 2016-08-19T17:41:12+00:00 To William Denny - 14 July 1758 2 To William Denny, Esquire lieutenant governor and commander in cheif [sic] of the province of Pennsylvania, &c. : The address of the trustees and treasurer of the Friendly Association for Regaining and Preserving Peace with the Indians by Pacific Measures. 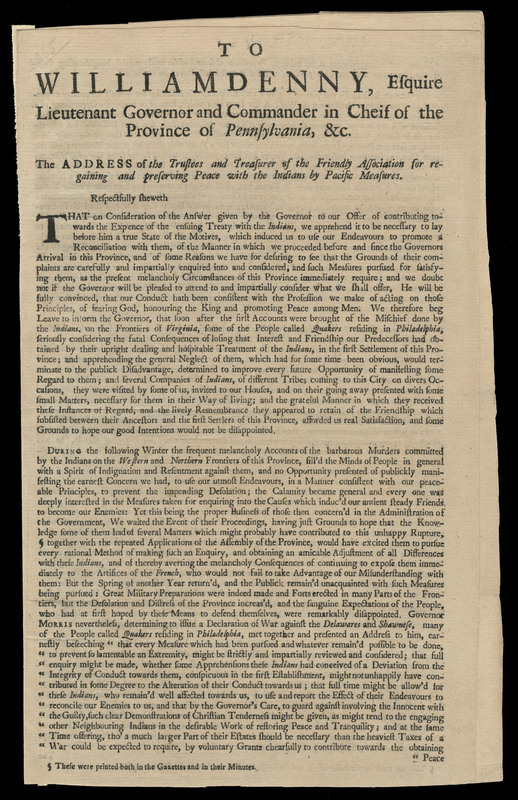 gallery 2018-02-12T12:43:59+00:00 [Philadelphia : s.n, 1757] Friendly Association for Regaining and Preserving Peace with the Indians by Pacific Measures. Call Number: Ab -3 Caption title. "Signed on behalf and by appointment of the said trustees and treasurer, by Abel James, clerk. 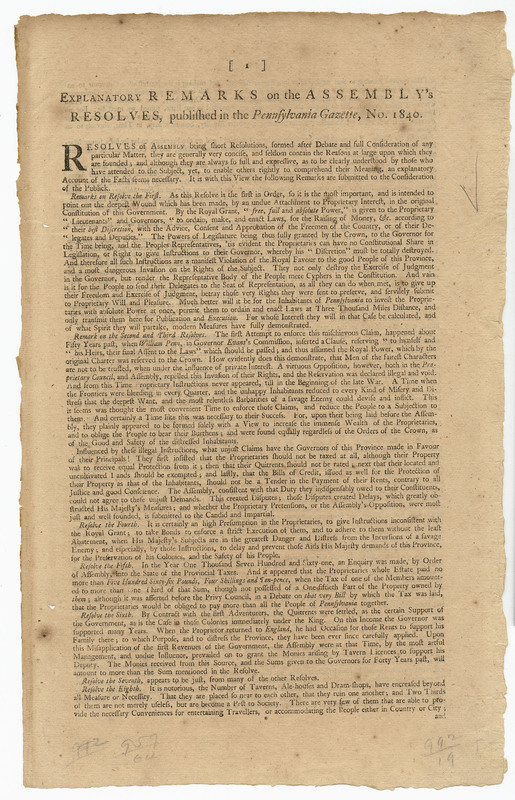 Philadelphia, the 14th of the seventh month, 1757." Ascribed to the press of Benjamin Franklin and David Hall by Evans. The ascription is disputed by Miller, who states that "it appears to be the work of either Anthony Armbruster or Christopher Saur." Evans, C. American bibliography, 8005; English short title catalogue (ESTC), W17836; Hildeburn, C.R. Pennsylvania, 1565; Smith, J. Descriptive catalogue of Friends' books, 2.462; Miller, C.W. Franklin, B75. Historical Society of Pennsylvania.